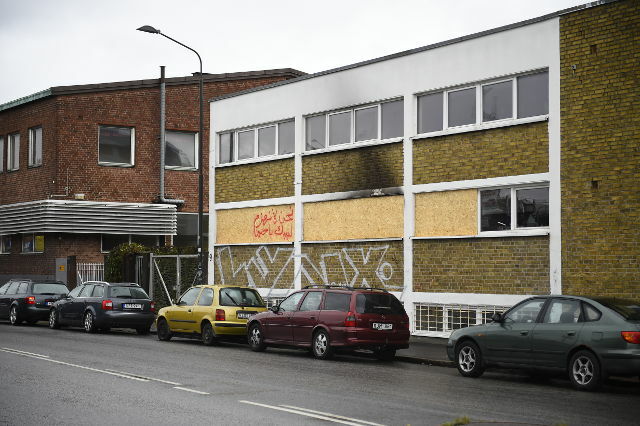 A prosecutor has charged a Syrian man with terror offences, alleging that he started a fire at a Malmö community centre in order to spread fear in the name of Isis. The 30-year-old suspect, who denies the charges and the allegations he is a member of Isis, is accused of throwing Molotov cocktails at the centre on October 11th last year, causing smoke damage to the building. In December, Malmö's district court judged in a remand hearing that, contrary to the chief prosecutor's wishes, there was not enough evidence to consider the fire a terror incident and instead remanded him in custody on suspicion of arson. But on Monday the prosecutor insisted that the man is affiliated with Isis and charged him with a "terror offence, alternatively arson". The charge sheet, seen by The Local, argues that "this arson could seriously have harmed the state of Sweden. The purpose of the attack was to seriously intimidate a population group, in this case Shia Muslims, in the name of Isis," adding that the man is a Sunni Muslim who has expressed dislike of Shia Muslims. According to the charge sheet, police searching his computer found a description of how to make a detonator, which the prosecutor argues shows he has knowledge of how to make bombs. Police also found propaganda films showing Isis soldiers fighting and killing "infidels" and a picture of an Isis flag. Prosecutor Agnetha Hilding Qvarnström said on Monday that the man had told other people he wanted to die "a martyr's death". This had emerged "in Facebook conversations, among other things", she told The Local. She said there was enough circumstantial evidence to build a strong case against the suspect. "I think I have enough material to want the court to take a position on whether or not this classifies as a terror offence," she said. There is no DNA evidence or finger prints linking the man to the crime scene, but the fire was caught on a surveillance camera. According to the charge sheet he wore plastic gloves which were later found in a bag in his home. The fire raised eyebrows in Sweden last year when Isis magazine al-Naba claimed it was started by "a warrior from the caliphate". Terrorism experts including Magnus Ranstorp told Swedish public broadcaster SVT that the claims should be taken with a "pinch of salt". It again grabbed headlines in February after it was included on the White House's list of 78 "under-reported terror attacks" (The Local and other Swedish media reported on the incident on several occasions). Qvarnström said she was aware of the list, but added that it did not play a part in her investigation. "I heard that President Trump had talked about it, but I don't know if there's much international attention otherwise. I look at the material I have and our legislation and then the court has to make their decision." The trial starts on Friday in Malmö District Court.